In the end, the film is neither entirely satisfying as a compelling romance, nor as a stirring patriotic drama about the role of the Indian National Army in India’s freedom struggle. Vishal makes an ambitious attempt to deliver a sweeping epic, but on a scale of Saat Khoon Maaf to Maqbool, this one sits somewhere in between. I’m going with two and a half out of five. Frankly, RANGOON is a complex film and it does take time to dissolve oneself wholly in the world of Rusi, Julia and Nawab. Thankfully, there’s much meat in the second half. The myriad emotions [love, jealousy, betrayal], the sequence of events in the second half, the nail-biting finale. On the whole, RANGOON is an epic love saga with strong emotional quotient, riveting second hour and nail-biting finale. Watch it for its layered plot, serpentine twists, proficient storytelling and bravura performances. A content-driven film that’s worth a recommendation! Rangoon is a re-imagination of history but the writing is inconsistent. In places, the transitions are abrupt and clumsy. So Rangoon is as flawed as it is fabulous. It’s over-stretched and over-wrought. Go in knowing that it is a polarizing film and that you are as likely to dislike it as you are to enjoy it. And yet, if you miss it, you miss a chance to immerse yourself into the epic imagination of VB. On the whole, Rangoon is entertaining but it is also too long, boring in parts and more class-appealing than mass-oriented. It will, therefore, do well in select multiplexes in some big cities, but this will not at all be enough to recover the huge investment in the film even after revenues from non-theatrical sources are accounted for. In the final tally, the film will entail heavy losses to the distributors concerned. Rangoon suffers a fair bit on account of its marathon, energy-sapping length and its disappointingly facile climax. But nothing can undermine its power as a risky but worthwhile cinematic idea that has been executed with flair and gumption. Rangoon is wholeheartedly recommended but with a rider: it isn’t a stroll in the park because it demands patience and concentration. It definitely helps that the cinematography (by Pankaj Kumar) is so lustrous that you simply cannot take your eyes off the screen. Bhardwaj, whose repertoire includes truly-fine works like Maqbool, Omkara, and Haider delivers, but not entirely. Some frames just hang, some scenes feel tedious. In his attempt to pack in too much on war, love and deceit, the maker ends up with some haphazard division of war scenes versus love games, leaving the viewer muddled. The intention of Vishal Bharadwaj’s ambitiously mounted film is clear: to weave the skeins of love and war in order to make a movie full of throbbing passion and grand statements. But the execution never quite matches up, the gap narrowing in just a few places, in the second half. It’s an ambitious film where Bhardwaj wants to merge two worlds: One inspired from Shakespearean tragedies and other motivated by the valiant lovers of the Indian cinema. In the end, neither comes alive on screen – on top of it a messy climax that topples whatever hard work was done building a world of romance. If you are a Vishal Bhardwaj fan, let us warn you that this might not be his best, but we bet you’ll see another kind of a storyteller here. And yes, he does deliver a movie that is embedded with fine performances from the cast and great visuals by cinematographer Pankaj Kumar and that makes the movie deserving of a watch despite its flaws. Rangoon is no masterpiece. It fails to rise above Vishal’s imagination of cinema. Lengthy and forced, it is a confused war-love-freedom struggle drama. Rangoon has grandeur but is a lost cause thanks to its multiple threads. Kangana and Shahid, leave a mark with their characters but do not help the film rise above its inconsistencies. A 2/5 for this. “Rangoon” is an epic love story, taking a beautiful film star from the film sets of 1944 Bollywood to the jungles of the India-Burma border where she must entertain the English and Indian troops. 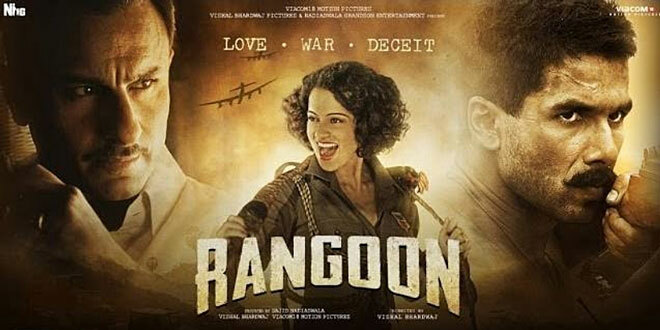 In the midst of battles and betrayals, Julia (Kangana Ranaut) falls in love with a young Indian soldier Nawab (Shahid Kapoor), and learns some bitter truths about the dream of Indian independence. Battle lines are drawn when her mentor and lover Rusi (Saif Ali Khan) learns of the torrid love affair.